Rarely available, 2 BR, 2.5 Baths, large 2 car garage, end unit. AC replaced 2016, dishwasher 2018, roof 2018. Light, bright & airy home offers diagonal, tile floor in wet areas, carpet, vaulted ceilings, fireplace, family room & formal dining.Remodeled large kitchen, stainless steel appliances,solid surface counter-tops, pantry, under cabinet lighting. Open up your entertainment space with sliders in LR & Breakfast area. Have your morning coffee in the enclosed lanai, relaxing and enjoying nature with a western, long lake view. Master Bedroom boasts updated bathroom, solid surface counter-top, wood cabinetry, dual sinks, tub, linen closet & glass enclosed shower. Remodeled half bath & guest bedroom has full, remodeled bath. Beautiful Community offers walking, biking, large, fitness center, Tennis courts, 18-hole Arnold Palmer Championship golf course /Golf Pro on staff. Remodeled Club house and Grill Room offers formal & informal dining options. The Village has a large heated Community Pool, Basketball & Tennis courts. Located minutes from shopping, dining, Airport, FGCU, baseball winter stadiums and more! Easy drive to beaches. Golf membership available for separate purchase. For more information about these events happening in Southwest Florida, please click on the links. Buyers: Don’t Be Surprised By Closing Costs! Many homebuyers think that saving for their down payment is enough to buy the house of their dreams, but what about the closing costs that are required to obtain a mortgage? By law, a homebuyer will receive a loan estimate from their lender 3 days after submitting their loan application and they should receive a closing disclosure 3 days before the scheduled closing on their home. The closing disclosure includes final details about the loan and the closing costs. But what are closing costs anyway? Closing costs are typically between 2% and 5% of your purchase price. Speak with your lender and agent early and often to determine how much you’ll be responsible for at closing. Finding out that you’ll need to come up with thousands of dollars right before closing is not a surprise anyone is ever looking forward to. Everyone wants a place to call home; a place that gives them a sense of security. We are currently seeing major interest from females who want to achieve this dream, and the numbers are proving it! 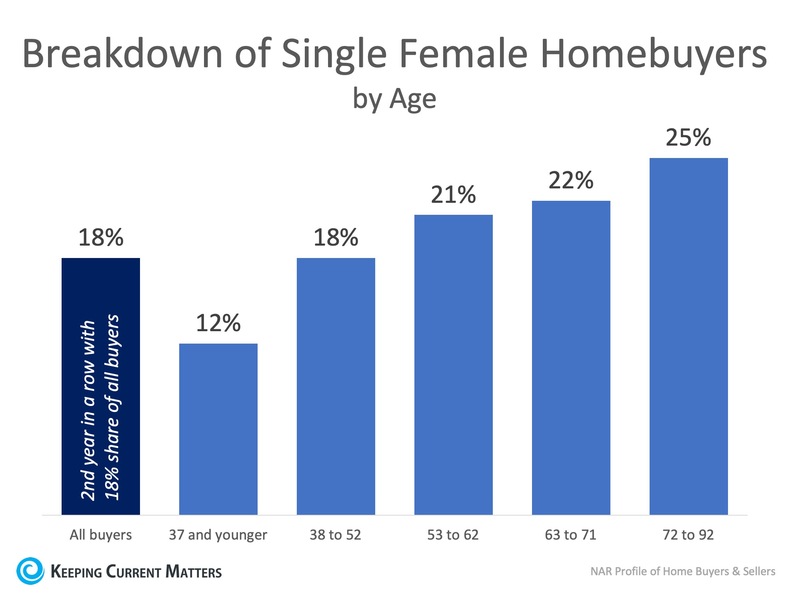 In 2018, for the second year in a row, single female buyers accounted for 18% of all buyers. In 2017, 60% of millennial women listed as the primary borrowers on mortgages were single. This does not come as a surprise since 50.8% of the U.S. population is female and 15.6% of them are 65 years and over, according to the Census Bureau. What are the reasons for this demographic’s booming interest in homeownership? Divorce rate: Known as the “Gray Divorce,” the divorce rate has doubled for those ages 50 and over and tripled for those ages 65 and over. Average life expectancy: For women it’s 81, four years longer than men. To build home equity: Women want to build equity through their home. As mentioned by Bankrate, “some are hoping to escape rising rents, some might be downsizing or looking for a new start,” especially those going through a gray divorce. Are they only downsizing and buying small homes? Whether you are a millennial who wants to buy a starter home, a billionaire looking for that luxury home you’ve always wanted, or maybe even someone who just went through a gray divorce, contact a local real estate professional who can help you create your real estate portfolio and start investing your money in real estate today! Every year at this time there are many homeowners who decide to wait until after the holidays to list their homes for the first time, while others who already have their homes on the market decide to take them off until after the holidays. Relocation buyers are out there. Many companies are still hiring throughout the holidays and need their new employees in their new positions as soon as possible. Purchasers who are looking for homes during the holidays are serious buyers and are ready to buy now. You can restrict the showings on your home to the times you want it shown. You will remain in control. Homes show better when decorated for the holidays. The desire to own a home doesn’t stop when the holidays come. Buyers who were unable to find their dream homes during the busy spring and summer months are still searching! The supply of listings increases substantially after the holidays. Also, in many parts of the country, new construction will continue to surge and reach new heights which will lessen the demand for your house in 2019. Waiting until after the holidays to sell your home probably doesn’t make sense. Are Homeowners Renovating To Sell Or To Stay? A ‘normal’ housing market is defined by having a 6-month supply of homes for sale. 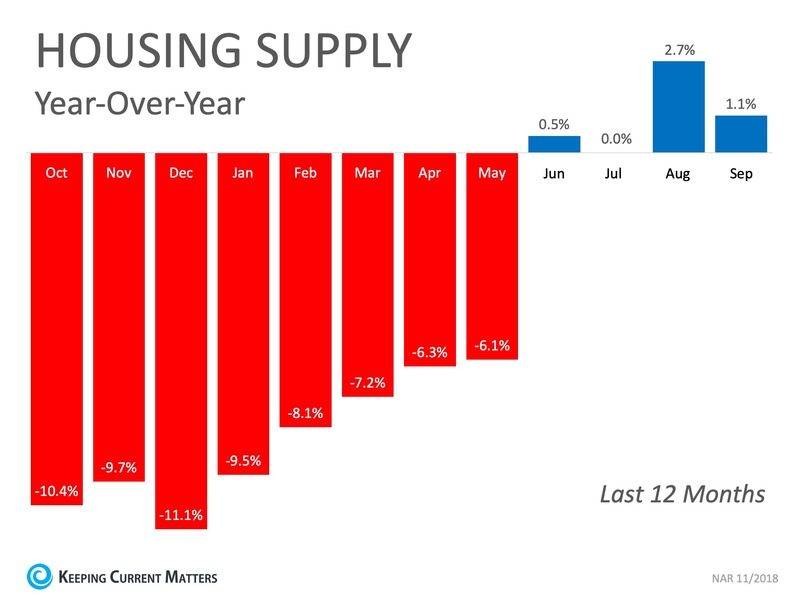 According to the latest Existing Home Sales Report from the National Association of Realtors, we are currently at a 4.4-month supply. This low inventory environment has many current homeowners worried that they would be unable to find a home to buy if they were to list and sell their current houses, which is causing many homeowners to instead renovate their homes in an attempt to fit their needs. According to Home Advisor, homeowners spent an average of $6,649 on home improvements over the last 12 months. If that number seems high, it also includes homeowners who recently bought fixer-uppers. Seventy-six percent of those surveyed said that they would rather renovate their current homes than move. The results are broken down by generation below. More and more studies are coming out about the intention that many Americans have to ‘age in place’ (or retire in the area in which they live). Among retirees, 91% would prefer to renovate than spend their available funds on a down payment on a new home. If their current house fits their needs as far as space and accessibility are concerned, then a renovation could make sense. But if renovations will end up changing the identity of the home and impacting resale value, then the renovations may end up costing them more in the long run. With home prices increasing steadily for the last 6.5 years, homeowners have naturally gained equity that they may not even be aware of. Listing your house for sale in this low-competition environment could net you more money than your renovations otherwise would. If you are one of the many homeowners who is thinking about remodeling instead of selling, sit down with a local real estate professional who can help you make the right decision for you based on the demand for your house in today’s market. If you are one of the many renters who would like to own their own homes, talk to a local real estate professional to find out if homeownership is affordable for you right now. Come home to this beautiful bundled golf course community with every amenity you want right here. The community features two 18-hole golf courses designed by Azinger & Lewis, 8 lighted Har-Tru tennis courts, 4 dining options, beautiful state of the art fitness and social building, swimming and much more. This first floor condo features a kitchen with pantry, breakfast bar and breakfast room with a bay window. The great room has crown molding, chair rail, and carpeting. Master suite has a walk in closet, linen closet, walk in shower, and ceiling fan. Guests can enjoy a guest bedroom and guest bathroom with tub/shower combo. Take in the outdoors on your screened lanai with roll down shades and a beautiful view of the golf course and lake. There is a storage closet directly across the hall form the condo big enough for golf clubs, bikes, and beach gear. The carport is conveniently located across the driveway. There is a grill and picnic table next to the carport for the building use. The satellite pool is close by for the building. Come home today and enjoy this community that is close to world class beaches, shopping, entertainment and dining. The Monarch Sales Group is a full-service, real estate team representing buyers and sellers in the Southwest Florida area. Their outstanding reputation ensures that each transaction is handled with discretion and provides clientele with an enjoyable experience and a seamless, stress-free transaction.